Long-time readers of Soult’s Retail View may recall my blog post from August 2009, where I wrote about part of the William Hill fascia at 41-43 Groat Market in Newcastle dropping off to reveal a George Rye & Sons ghost sign underneath – a fragment of the famous local footwear retailer that had previously traded from the site for nearly 130 years. 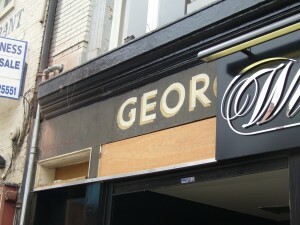 Now, five years later, the George Rye signage has been uncovered in its entirety following the closure of the William Hill shop, promoting the inevitable flurry of interest and chatter on Twitter. 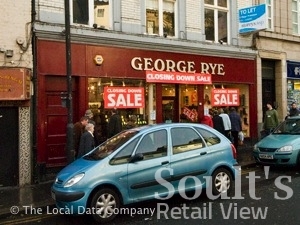 As I noted last time, George Rye was something of a Newcastle retail institution, opening its store in that location in 1879 and surviving until the end of 2007. During that time, it saw department store Bainbridge opposite both open its Bigg Market frontage (in 1879) and vacate the site for a new spot in Eldon Square almost a century later (in 1976 – now John Lewis), and survived the 1996 departure of the Binns (House of Fraser) store that had in turn taken over the Bainbridge site in 1977. 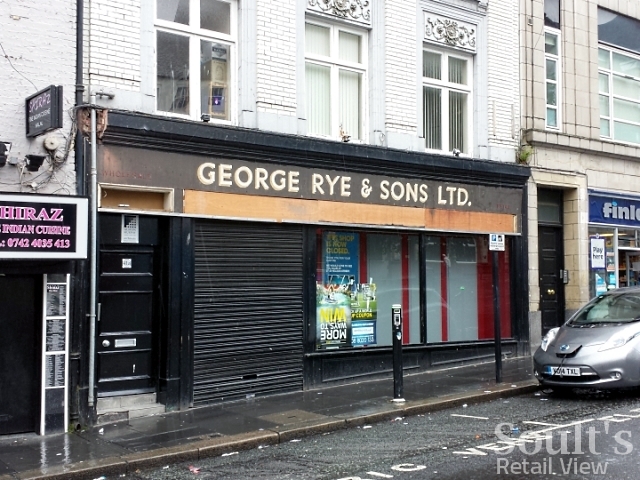 Meanwhile, the Bigg Market area had morphed from a retail destination into one dominated with clubs, takeaways and student flats, with George Rye both a symbol of retail longevity and a reminder of quite how much the surrounding business landscape had changed. 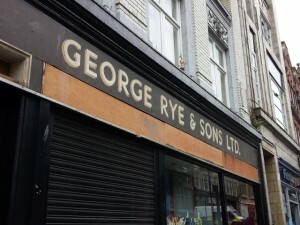 It’s worth pointing out, of course, that the elegant but somewhat old-fashioned ghost sign that we see now wasn’t the one that George Rye was using at the end – that business too had modernised over the years, at some point covering up its own earlier signage with a newer, deeper, bolder fascia. 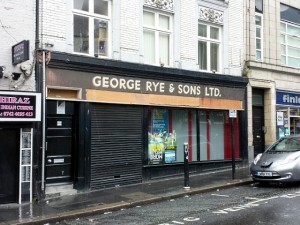 Meanwhile, the George Rye company remains in business today as wholesaler GRS Footwear, whose present-day brands – such as Lunar – are sold by a raft of department stores and shoe shops, including that other (but slightly younger) North East footwear retail institution Charles Clinkard. As for the Bigg Market area, the departure of William Hill – a rare occurrence in a city centre where bookmakers have seemed to multiply in recent years – is perhaps indicative of the declining fortunes of that particular part of Newcastle. Nightlife seems to have gravitated south towards the so-called Diamond Strip or north towards The Gate, leaving the Bigg Market as a place to pass through rather than the iconic going-out destination of old. Indeed, the former premises of Bambu – built behind the retained Bigg Market frontage of the old Bainbridge and Binns store, and one of the city’s biggest and most popular clubs throughout the 2000s – remain vacant following its owner’s collapse into administration last year. 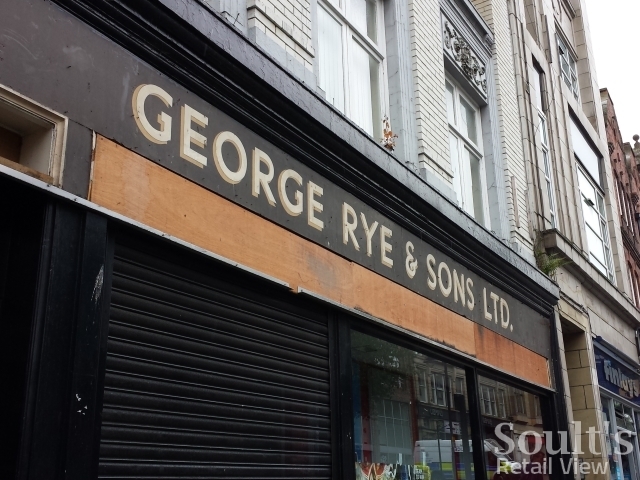 So, as the Bigg Market quarter continues to evolve – and seeks, once again, to define a new purpose for itself – we can perhaps expect that George Rye ghost sign to remain on show for a little while yet. My retail consultancy business, CannyInsights.com, provides bespoke place- and sector-specific market intelligence, including historical and archival research. It also works with retailers to improve their stores, customer communications and market knowledge. For more information, visit www.cannyinsights.com, drop me an email, or give me a call on (0191) 461 0361.